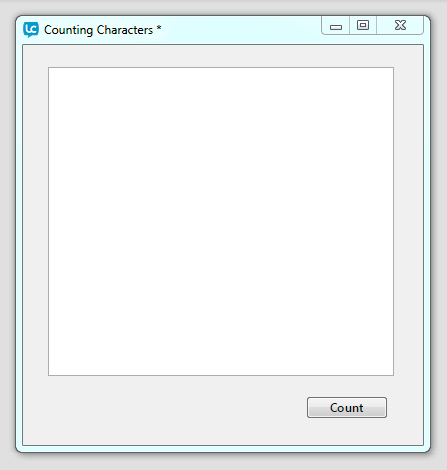 This lesson will show how to count the number of upper case characters and lower case characters in a string. All we need is a field to enter our string into and a button to call the handler which counts the number of upper and lower case characters. Name the field "entry" and the button "Count". Now we need to decide what our function will do. That seems simple, now lets script it in LiveCode. In order to identify whether a character is upper or lower case we need to set the caseSensitive property to true, by default this property is set to false. We will set it to true in our script. Once LiveCode is case sensitive when performing text comparisons how do we check whether a character is lower or upper case? We can do this using the toLower and toUpper functions. These functions convert strings to all lower or all upper case letters. By converting a character to lower case and then comparing it to the original character we can identify whether it was originally lowercase or not. so we know the original character was lower case. ## If we make the character lower case is it the same as the original character? ## If we make the character upper case is it the same as the original character? Switch to Run mode and test it. 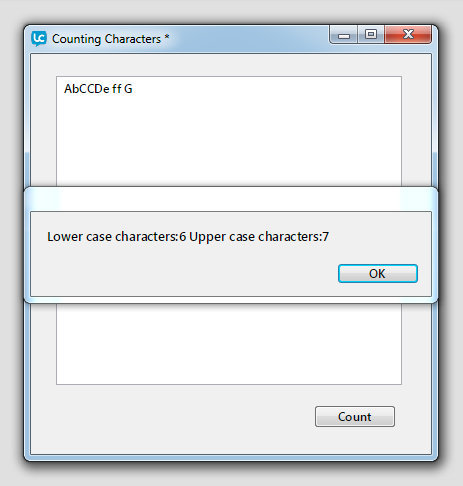 Enter some characters in the field to test for upper or lower case. Prev: How can I search delimited data for a matching string?